Both Michigan-based General Dynamics Land Systems and BAE Systems will have the next 14 months to build and begin delivering 12 prototypes of the Mobile Protected Firepower vehicle. BAE Systems will build an M8 Buford Armored Gun System with new capabilities and components. GD submitted an offering that puts a version of its latest Abrams turret together with a chassis that uses past work on the United Kingdom’s AJAX program. 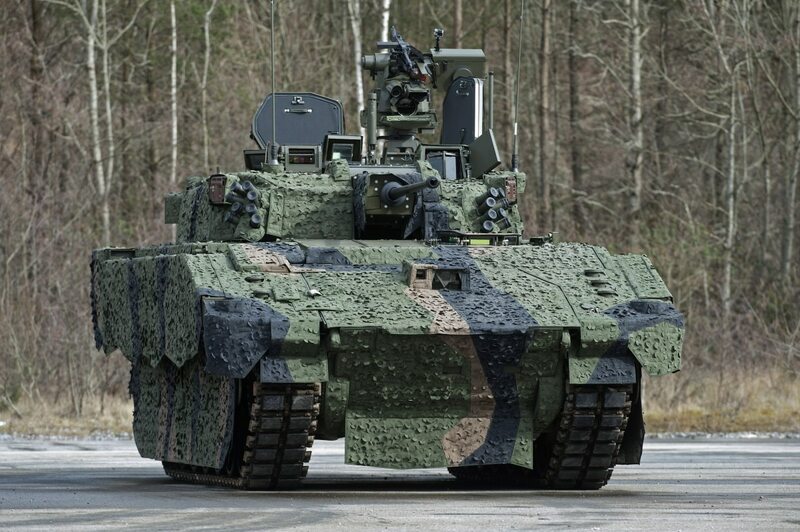 The Army is expected to make a decision by the end of the year on which companies will build prototype vehicles as part of its light tank competition. The ultimate product will be either a 105- to 120mm cannon and a tracked vehicle that can withstand a classified level of enemy fire. At least two of the vehicles should be able to fit into the back of a C-17 aircraft. The need is aimed at near-peer threats. Brig. Gen. Ross Coffman, director of the Next Generation Combat Vehicle Cross Functional Team, said that the current and future battlefield will challenge the firepower of the infantry. Right now, Infantry Brigade Combat Teams have artillery to knock out secured enemy positions. “But there’s no precision munition to remove bunkers from the battlefield, to shoot into buildings in dense urban terrain,” Coffman said. The MPF vehicle and weapon will be used to “disrupt, break in and breach those secure defensive zones,” Coffman said. The requirement first emerged in the Army’s vehicle modernization strategy in late 2015. The target was to give IBCTs a protected, long-range, cyber-resilient, precision, direct-fire capability for early or forcible entry operations. In February, GD and BAE, along with SAIC partnering with Singapore’s ST Engineering and CMI Defense, all submitted proposals. The SAIC team combined CMI’s Cockeril 3105 turret with ST Engineering next-generation armored fighting vehicle chassis. Officials would not discuss the reasons behind the selection. They expect a final decision to be made by fiscal year 2022. Fielding to the first units is expected by fiscal year 2025. The MPF is under the Army’s NGCV CFT program, which is overseen by the Army Futures Command. The plans are for roughly 54 vehicles, initially. They will build 26 first, with an option to build 28 more and retrofit eight prototype vehicles. For the existing vehicle fleet, there’s another program that’s been conducting recent testing to also enhance the combat vehicle firepower and protection. The Army chose to evaluate two Active Protection Systems at a November live-fire rodeo, looking at whether either system could work as an interim protection system for one of its combat vehicles. The APS will also go onto the MPF vehicle in development at this time. The Israeli-made Trophy VPS by Rafael, a slimmer edition of the Trophy System already on the Abrams tank, and the German-made Active Defense System by Rheinmetall got a chance to showcase their products' abilities atop Strykers at the live fire, according to Military Times sister publication Defense News. Army representatives saw the Trophy VPS on a Bradley Fighting Vehicle at a demonstration in Israel in August, Defense News reported. Earlier this year, the Army awarded a $193 million contract to Leonardo DRS for its Trophy APS on the M1 Abrams tank. The program conducted four “soft kill” demonstrations using virtual threats with the system and controller. The APS is an interim solution as the Army develops its Modular Active Protection System as part of a larger suite of Vehicle Protection Systems. In late 2018, developers with the Tank Automotive Research Development and Engineering Center completed successful testing on the MAPS. The MAPS base kit is an array of sensors and countermeasures used with the Modular Active Protection Systems Controller, giving vehicle crews a single solution to run APS for incoming threats such as enemy drones or anti-tank weapons. Bill Beyer, MAPS Virtual Demonstrator lead, said in release following MAPS testing that the base kit would move into the vehicle program portfolio by mid-2019. Rafael was selected to provide its Trophy APS for the Abrams while IMI, also an Israeli company, has put forth the Iron Fist for the Bradley. Participants didn’t fully install their systems on the vehicle. They put up mock rigs for testing in front of Strykers mounted their system on a Stryker.